Pierluigi Cerri (Novara / Italy, 1939) Architect, graduated from Politecnico di Milano, he has a full curriculum of activity. In 1974 he was a founding member of Gregotti Associati with whom he won numerous architectural contests. In 1976, member of the Alliance Graphique Internationale, he directed the image of the Venice Biennale. 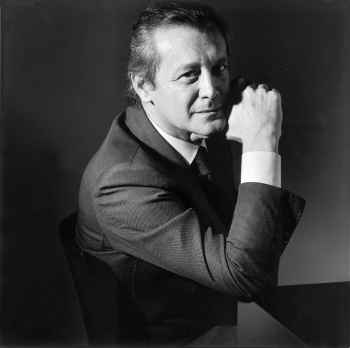 In 1998 he founded with Alessandro Colombo the Studio Cerri & Associati and numerous are the achievements, projects and recognitions of his and the partners: renovation of Palazzo Marino alla Scala and Fondazione Arnaldo Pomodoro in Milan-National award Reed-In/Arch in 2016; Corporate identity for Lingotto in Turin, Italy ‘ 90, Pirelli, Salone del Mobile in Milan, MART Museum of Contemporary Art of Trento and Rovereto, Triennale di Milano, Prada American’s Cup, Genova04 European Capital of Culture, City Life, interiors and livery high trains Speed NTV, installations Shanghai Italian Center Pavillion on the site Expo 2010. Countless accolades: Compasso d’oro 1995, 2001 and 2004, award Art Director Club to career 1994, award for Good Industrial Design – Gold Product Design 2003 by Industrie Forum design Hannover and International Super Yacht Design Award, Live Time Award To the 2004 career and silver Lady of the museum Poldi Pandian of Milan 2006. In 2017 he designed the productions for the exhibition of Caravaggio at Palazzo Reale and is the author of the Landside project of redesign of the façade of Milan Linate Airport.